The protection of the honey bee has been a popular topic of conversation in recent years. While research into colony collapse disorder (CCD) continues, several stakeholders in Mississippi have collaborated to form the Mississippi Honey Bee Stewardship Program. The participants include beekeeper associations, agricultural consultants, and Mississippi State University Extension Service, just to name a few. We asked Tyler Smith to talk about the Mississippi Honey Bee Stewardship Program. 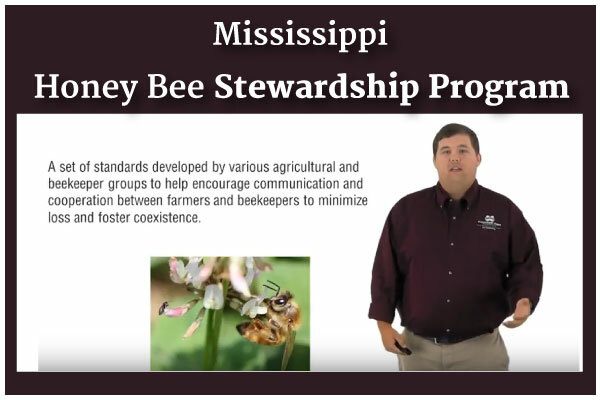 For more information on CCD and the Mississippi Honey Bee Stewardship Program, check out the rest of Tyler Smith’s class on Pollinator Stewardship! You'll find this and more at Certified Training Institute's Pesticide Division. Click the button below, choose your state and get started today! This entry was posted in Pesticide and tagged Bees and Pesticides, Honey Bees and Pesticides, Mississippi Honey Bee Stewardship Program.